Entity Relationship Diagram (aka ERD, ER Diagram, E-R Diagram) is a well-tried software engineering tool for data modeling, system design and illustrating the logical structure of databases. Introduced by Peter Chen the ER modeling technique is now successfully used in software development, when creating conceptual data model of an information system. There are used three basic elements for ERDs construction: entities, attributes, relationships. Chen's notation for ERD assumes the use of rectangles to represent entities and diamonds to represent relationships between first-class objects. Another popular notation for ER diagrams is Crow's foot notation. 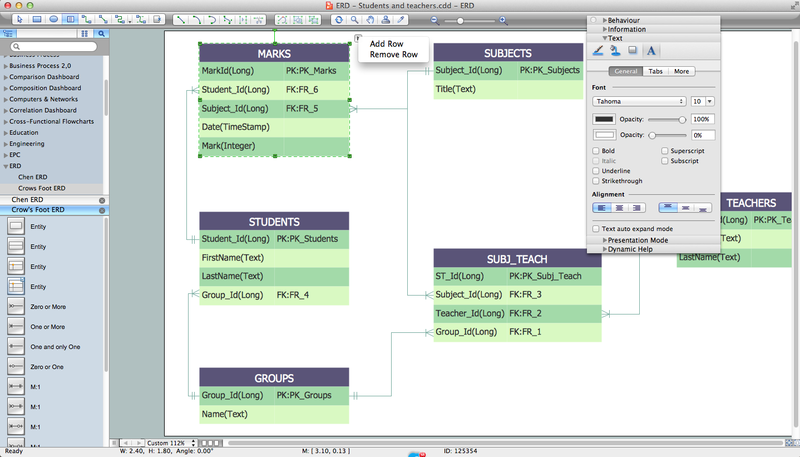 Professional ERD drawing is an essential software engineering method for database modeling. ConceptDraw DIAGRAM as a powerful Entity Relationship Diagram software engineering offers the tools of Entity-Relationship Diagram (ERD) solution from Software Development area of ConceptDraw Solution Park. Use ConceptDraw DIAGRAM enhanced with Entity-Relationship Diagram (ERD) solution to draw Entity Relationship Diagrams using Chen's or crow's foot notations. This solution contains a lot of useful drawing tools, 2 libraries with 45 vector design elements for both notations, and amazing collection of ready ERD samples, examples and templates for quick start. The Entity-Relationship Diagram (ERD) solution for ConceptDraw Solution Park is an effective help in description a database using the Entity-Relationship model. Make sure this right now! What's the best ERD tool for the Mac? What's the best ERD tool for the Mac? ConceptDraw DIAGRAM v12 on Mac OS X supplied with Entity-Relationship Diagram (ERD) Solution from the Software Development Area for ConceptDraw Solution Park is the best ERD tool! This solution offers for ConceptDraw users so powerful drawing tools, libraries with numerous ERD objects, which will help design ER diagrams of any complexity and any design you want. Picture: What's the best ERD tool for the Mac? Database structures are usually described by ER-diagrams which represents entities as boxes with lines-connections between them. You can create any entity-relationship diagram (ERD) by means of ConceptDraw DIAGRAM v12 using ready-to-use templates and special libraries containing all the needed symbols and shapes. Creating a model for your database from now on can take just a few minutes. ERD (entity relationship diagram) designed to show the logical structure of databases. 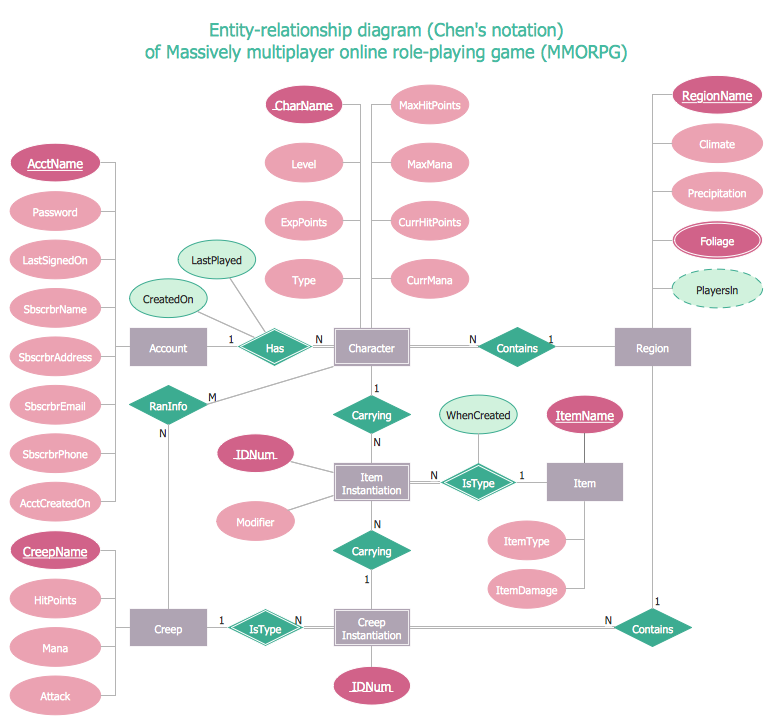 It intended to depict the relationships between data components (entities). ERDs are a popular tool for software engineers and architects. Using ERD they can manage the every aspect of database design. Also ERD can be used as guidelines for testing and communications before software release. This diagram represents the file reference system of the WordPress web platform. Because entity relationship diagrams have such a broad application area through the prevalence of database technology, it can be applied for a wide range of users. You need design the Functional Block Diagram and dream to find the useful tools to draw it easier, quickly and effectively? ConceptDraw DIAGRAM v12 offers the Block Diagrams Solution from the "What is a Diagram" Area which will help you!